If you’re going to a Halloween party with friends it’s a fun idea to wear something that will make people laugh. And if you’re a teacher at a school you can make your students laugh out loud with a hilarious costume. 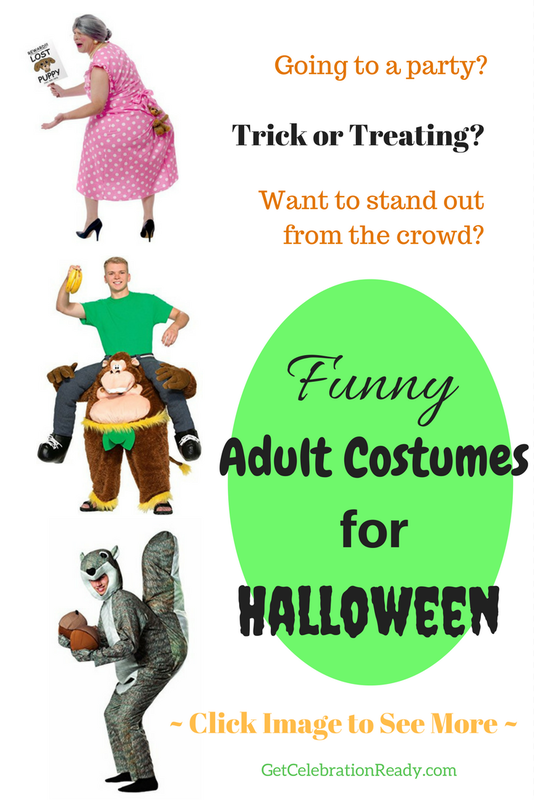 To see the top 5 funny adult costumes for Halloween, read on…and be prepared to smile! With Halloween right around the corner, now’s the perfect opportunity to start looking for Halloween costumes for adults. And if you want to go with something a little different, think about wearing a funny costume. These become a lot of fun when you go to events and just imagine if you wear the costume to work. Your co-workers will get so many laughs from your funny costume. You’ll be the center of attention. ⇒ See the current price on this hilarious costume, click here. This is a hilarious Halloween costume that is all in good fun. 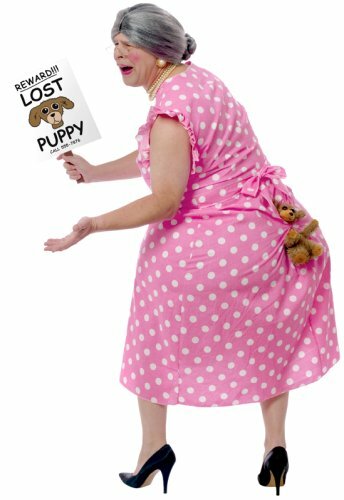 The costume is oversized to look like a woman who is looking for her puppy, which is actually stuck to her backside. The costume is one size, so that it fits most teenagers and adults. You will be wearing an oversized bodysuit that comes with the puppy attached to the back and also includes a lost puppy sign to carry around with you. The costume is made from polyester, while the sign is made from wood. You will be wearing the pink polka dot dress with this costume, as shown in the picture. ⇒ For the price on this fun monkey costume, Click Here. 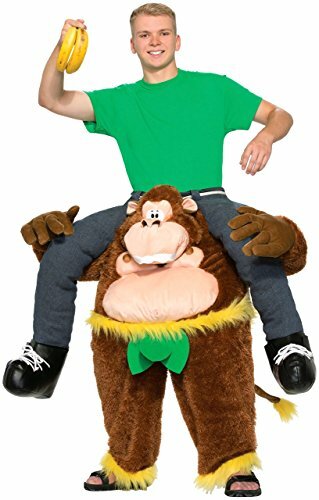 This funny monkey costume has the look of a monkey with a person riding on its shoulders. It is an adult size costume in just one size, so it should fit most adults. The costume is just one piece, where you pull it on and it covers your body from neck to feet. All you need to do is put on some shoes and decide how to do your makeup and hair. The bodysuit is in multiple colors and has a cute monkey on the back as if you are riding on its shoulders. The costume size is 16 inches high and 9 inches wide. This squirrel Halloween costume is both cute and funny! It is a lighthearted costume appropriate for just about anything, whether you are trick-or-treating, attending a Halloween party, or even going to work or school. It is in a grey color and is made of polyester, needing to be hand washed. 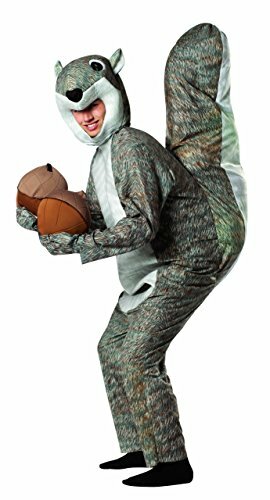 The costume includes the two acorns. These acorns will, of course, become the focus of many jokes if worn by a male. Many buyers of the costume have chosen to tie the acorns together with a piece of elastic or cord to make them easier to carry together. This is a good idea if you’re wearing it to a party. This costume could be worn by women, men or teenagers. This is a super fun and funny Halloween costume! 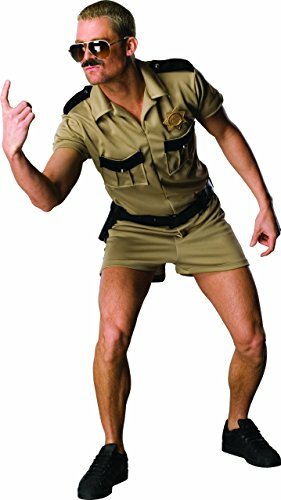 You can wear the short Reno 911 costume that Lt. Dangle wears in the popular television show. The brown costume includes the shirt and shorts from his police uniform, along with a belt and police badge. It is released by Rubie’s, which also provides other accessories for the police uniform costume, including wigs and sunglasses. There are lots of different accessories available, see some of them below. 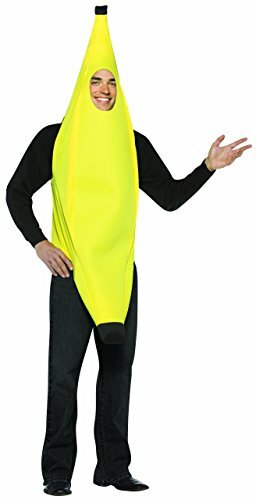 What is easier and more fun than wearing a big yellow banana for Halloween? This is another costume that is not only funny, but easy to wear for any type of event. It is work and school-appropriate and can be worn for Halloween parties and events. This is an inexpensive costume that is perfect if you are looking for a last-minute option and don’t want to think too hard about your costume. It comes in just one piece and one size that fits all. Where to buy funny adult costumes? Leading up to Halloween you don’t want to miss out on your chosen costume. If you can order online you not only save time but you can avoid the shopping chaos that happens at this time of the year. As we all know, lots of people leave it to the last minute to buy costumes, food, decorations and more. If you are in time to get funny adult costumes delivered before Halloween then take a look on Amazon. See lots of hilarious costume ideas here.